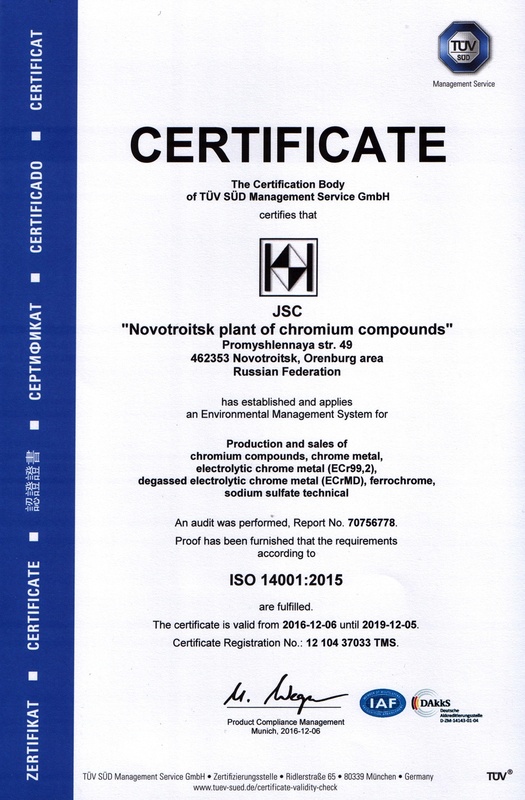 Joint Stock Company “Novotroitsk plant of chromium compounds” aspires to intensify a confidence of the general public and of downstream users of our products, improve its public image and competitiveness not only in domestic market, but in international markets. 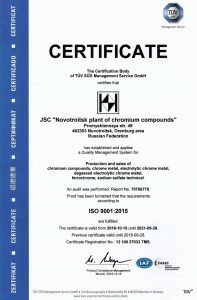 Since 2013 at JSC “NPCC” Quality Management System (QMS) was developed, implemented, is in effect, kept in a working order and constantly improved. 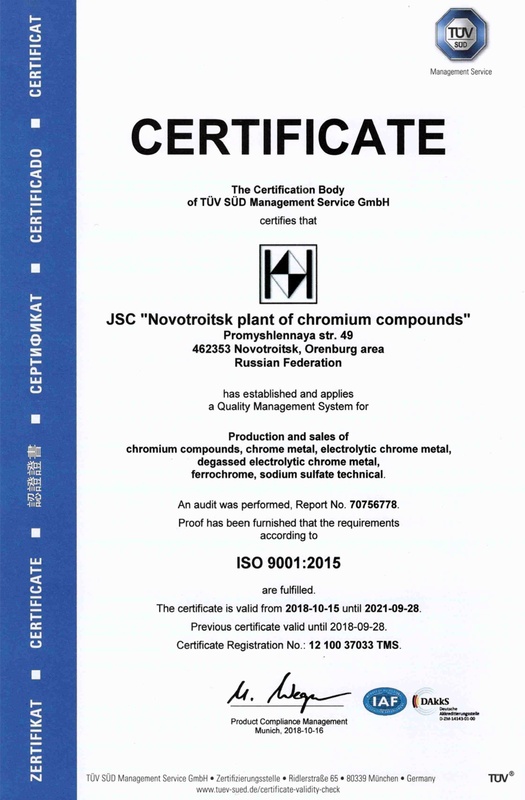 QMS is in accordance with requirements of international Standard ISO 9001 and of national Standard GOST P ISO 9001 “Quality Management System. Requirements”. Availability of the stable effecting QMS was a strong basis for implementation at the enterprise in 2016 of Environment Management System (EMS) and for its certification to requrements satisfaction of ISO 14001 “Environment Management System. Requirements and Manual”. Quality Management System and Environment Management System are certified by one of the lead international organizations for certification TÜV SÜD Management Service GmbH and by National institution for certification of management systems “PRONAP-TEKHNO”. Annually at JSC “NPCC” a supervisory audits of QMS and EMS are performed by certification bodies, and one time per every 3 years QMS and EMS of the enterprise are checked through widespread audit in purpose of recertification. The latest in a series of external audits of QMS and EMS, performed in September of 2018, again confirmed accordance of management systems of our enterprise with high international and national requirements.